With Electric Rescue, the French DJ D’Jedi, who is known all over Paris, becomes a part of the Cocoon family; he is connected with the development of Techno in France already since the beginning of the Nineties. Despite being busy as a producer for commercials and soundtracks, he always finds some time to release exciting electronic music on imprints such as F Comm, Communiqué, ELP Media and Paul Nazca’s label Scandium, where he has released his debut album “EL.UE” three years ago. 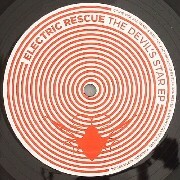 With the two tracks on “The Darkest Star", Electric Rescue succeeds in the daring feat of transforming the energy of rave tracks from the early Nineties into the present time without producing an anachronistic impression. Besides a tectonically shaking bass drum, the title track relies on the power of sound, a superlative of raw club energy with a twist of irony, which can set a surprising climax with a steadily rising noise level, even after almost ten minutes. “The Devil’s Dance” is grafting a comparably brute state-of-emergency Techno in a somehow restrained way, rhythm-wise, but is no less effective with its distinctive Acid sound effects. And who said that modern Techno can’t use the tradition of Belgian Rave-signal-floor-burners?